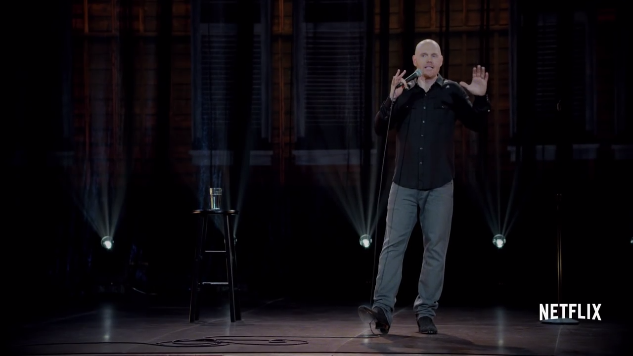 For someone with a baby that’s not even one month old, Bill Burr sounds as lucid and sharp as he does onstage or on his much-loved podcast The Monday Morning Podcast. At this point in his career, it doesn’t seem like much could faze Burr. A 25-year veteran of the stand-up world, he’s pretty much seen and done it all. He’s been through wringer of network TV nonsense as a cast member of the quickly canceled ‘90s sitcom Townies (co-starring a post-Brat Pack Molly Ringwald and a pre-Gilmore Girls Lauren Graham), and stumbled into other acting work in small and large screen entertainment, including his memorable appearances on Chappelle’s Show and Breaking Bad. Burr has even developed his own TV show for Netflix, the warm-hearted and critically beloved animated series F Is For Family. Through it all, Burr has grown in stature and regard as a comedian, honing a voice that is equal parts incredulity at the state of the world, bemusement at his own missteps and cathartic anger. It’s the kind of a mixture that makes him a go-to guest on Conan, Kimmel and many, many podcasts beyond his own. And it’s what makes his stand-up specials like the recently released Walk Your Way Out so popular. Burr is the voice of an untrammeled id, skirting the edge of political correctness and almost delighting in the discomfort that he can occasionally feel ripple through a room when he’s working. Just watch for the moment in Walk Your Way Out when he brings up Kanye West to a few hundred people from Nashville and see if you can spot the little glimmer of glee that flashes in his eyes when he realizes he’s set them on edge. There’s no sense that Burr has planned for much in his career really outside of what joke to tell next. Like his comedy brethren, there’s the simple drive to seek out stage time wherever it’s available to work out his material. Everything else is the luck of the draw. Two of the most groundbreaking TV series of all time needs a tall, red-headed Bostonian in the mix? Sure. Podcasts are becoming one of the biggest outlets for comics to have their voices heard and to promote their gigs? Not only does he have his own show, but he also fell into the wild world of podcasting with remarkable savvy—he’s the co-creator of the All Things Comedy podcast network, supporting the work of fellow funny people like Jen Kirkman, Ari Shaffir and Brian Scolaro. Then there’s the case of his other Netflix endeavor F Is For Family. The half-hour animated series that looks in on the lives of a brash, foul mouthed working class clan from Pennsylvania and boasts voice talent like Laura Dern and Justin Long was something that Burr wound up-half pitching to Vince Vaughn when they met a few years ago. While Netflix were only willing to dole out enough cash to fund six episodes, the response to the first season, which debuted in late 2015, was so positive that they welcomed the show back for round two (out in late April or early May). And while he waits for the torrent of promotional duties that will arrive when that is formally announced, Burr has few plans other than to keep trucking along with both stand-up comedy and podcast recording… and turning into an obnoxious new father. Walk Your Way Out is streaming on Netflix today. Robert Ham is an arts and culture journalist based in Portland, Oregon. Read more of his work here and follow him on Twitter.